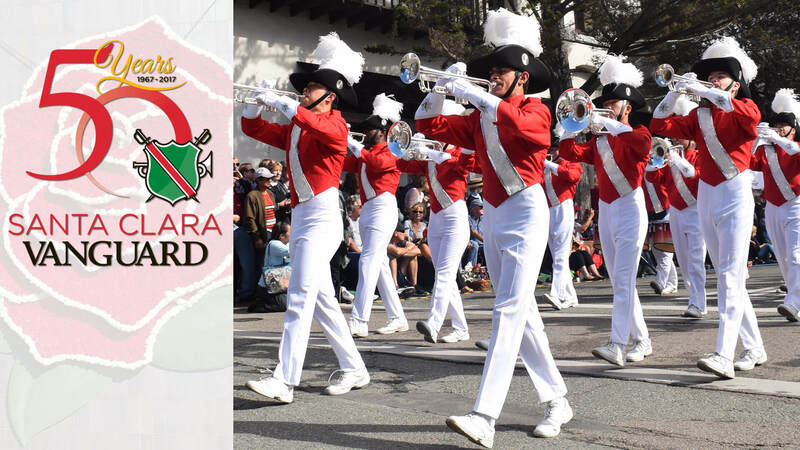 Santa Clara Vanguard has been selected to participate in the 128th Rose Parade presented by Honda on January 2. This will be the corps’ second New Year’s trip to Pasadena after making an appearance at the parade in 2004. Once again, they will proudly represent the City of Santa Clara, California and Drum Corps International as a whole, while performing live for thousands of viewers across the country. Last February, 2017 Tournament of Roses President, Brad Ratliff, a musician and drum corps fan, paid a visit to Santa Clara to see the Vanguard in action. During his visit he attended rehearsals for the Vanguard, SCV Winter Guard, Vanguard Winter Percussion and Vanguard Cadets, and served as the special guest at the organization’s annual birthday dinner celebration. At the end of the weekend Ratliff offered the corps a very special opportunity. Although most would refer to Fall and Winter as the “off season” for drum corps, things have not slowed down for Vanguard. From fundraising and music licensing to logistics and uniform maintenance, the Vanguard staff, along with a legion of loyal volunteers, has been working tirelessly to organize and prepare for this monumental event. "Preparing for the Rose Parade has been a massive undertaking, but one I am confident will yield incredible results," said Santa Clara Vanguard Director of Programs, Shaun Gallant. "With all the housing, transportation, food, and uniform logistics, the process is very similar to planning our summer tour. Thankfully we have a great set of volunteers who are really stepping up to the plate for us when we need them!" The corps has also benefited from the support of a number of loyal corporate partners including Stanbury, Field & Floor FX, Dynasty, Innovative Percussion, FGFactory and DSI to help make this year’s Rose Parade trip a reality. As New Year’s Day approaches, Vanguard will also be busy with a number of other performances and outings while in Southern California. Bandfest presented by Remo, features the many outstanding marching bands selected to participate in the 2017 Rose Parade. The corps will perform an abbreviated standstill of its 2014 “Scheherazade” program at the event on Friday, December 30, which will take place at Pasadena City College’s Robinson Stadium, site of the 2007 DCI Open Class World Championships. On television, tune in to the live Rose Parade broadcast the morning of January 2 beginning at 8 a.m. PT. Drum corps fans can also follow Santa Clara Vanguard members throughout the week on Facebook, Twitter, Instagram (@scvanguard) and Snapchat (@scvanguard) for an exclusive behind-the-scenes look at their preparations for the big day.